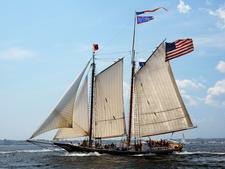 Launched in 1930, American Eagle was the last fishing schooner built in Gloucester, Massachusetts. For much of its career, the vessel served as a dory trawler, catching fish by hook and bringing home up to 100,000 pounds of cod and haddock per trip. The ship's last fishing trip was in 1983. 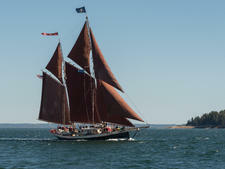 American Eagle 's master/owner, John Foss, grew up on the Maine coast and has skippered his own windjammer since 1973. 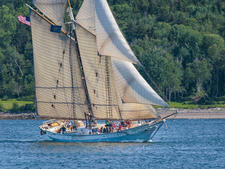 He spent two years restoring the schooner to her original appearance before taking to the water again as a passenger ship in 1986. Of American Eagle's 14 cabins, six can be arranged for double beds; the others have bunk beds. The average size is 50 square feet. While all cabins accommodate two people, single occupancy is available for an additional charge. Cabins have sinks with hot and cold running water, reading lights, 120-volt outlets and comfortable bunks with linens and blankets. The vessel is heated below for comfort early and late in the season. 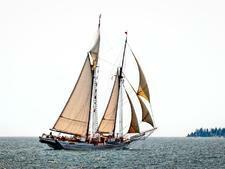 There are two bathrooms, or heads, below deck as well as a separate hot water shower. Passengers must be a minimum of 12 years old unless a cruise is chartered by a family or group. There is no set itinerary. Passengers may choose to join in with the friendly crew or relax, taking in the scenery or borrowing a book from the ship's library. The captain is "notorious" -- his words -- for sea story and poetry readings in the evenings. 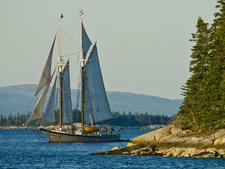 While at anchor, American Eagle has several hand-built wooden small boats for exploring harbors under sail or via oars. American Eagle serves three meals a day, all prepared on a wood-burning stove. 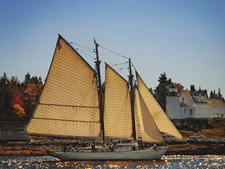 The cuisine is "Down East" cooking, meaning fresh fish, local produce, Maine blueberries and homemade soups and chowders. Passengers are welcome to join in on deck as well as in the galley, perhaps hand cranking ice cream for the evening's dessert. There is a big ice chest on deck for beverages that passengers might want to bring. 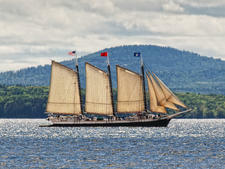 Every trip includes an island lobster bake with time to explore or take a dip in the cool Maine waters while the picnic is readied on a deserted pristine beach. Ecological stewardship is part of every cruise. Captain Foss shares what he's learned from the Leave No Trace Familiarization program and has supported coastal conservation groups for many years. The wharf has free parking and there is convenient bus and air service to Rockland.